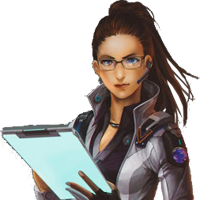 Explorers Unlimited • View topic - Susan Lee (Human Cyber-Doc) -- LEVEL UP! Sentiments/Non-Humans: Fascinating! There is so much we can steal from their genetics! I mean, learn from them! Sentiments/Coalition: Short-sighted fools blinded by their own hate and lust for power. I'll show them all! Disposition: Pretty intense. It's clear that she means well, but doesn't understand how her ideas are sometimes frightening to others. Numbers in parentheses are from increases due to Naruni Armor bonuses. Weight: That's a rude question. 150 lbs. Description: Susan has dark hair and tan skin, as is common in the large population centers of the Post-Apocalypse Midwest. Although of average height and weight, her training for what she imagines the life of an explorer and adventurer must be like have left her more muscular than the average doctor and scientist. Find Bionics and Cybernetic Contraband -- +20%, 35% discount, 50% from Black Market in exchange for 12 hours service, max of 100,000 credits every 12 hours. Last edited by Susan Lee on Mon Dec 17, 2018 11:25 am, edited 21 times in total. • Robotic Exoskeleton: Robotic P.S. 25, +4 to P.P., +20 to Spd., +10' to leaps, +10% to Climb, reduce the rate of fatigue by 75%. • Integrated Sensor Pod: motion detector w/360° scanning capability. HUD displays threats as flashing red icons. +3 to initiative, +2 to parry and dodge, + 5 to roll with impact; allows wearer attempt to dodge all attacks, even those from behind and/or surprise. • Damage: 3D6 M.D. per strike of the weapon. • Range: Hand-held like any knife; cannot be thrown (automatic shut off feature). • Payload: 30+1D4x10 minutes per standard E-Clip; unpredictable duration. • Note: The laser knife cannot be used to parry any type of attack; it cuts everything it touches. • • Laser: 4D6 M.D. • • Ion Blaster: 3D6 M.D. • Rate of Fire: Each laser shot fired requires two melee actions to aim and shoot. Each ion blast counts as one melee action/attack. • Modifiers: +3 to strike with the laser; only +1 to strike with the ion blaster. • Features: Integrated laser targeting and superior balance for the laser (bonuses already included). A compact yet extensive medical kit with all of the necessary supplies for routine as well as emergency medical treatment. It contains all of the items typically found in a first-aid kit: sterile bandages, gauze, medical tape, etc.) plus a miniature diagnostic computer with a holographic display that is capable of monitoring all of a patient's vital signs, a complete set of medical and dental implements/tools, basic medicines and painkillers, a quick hardening chemical cast (2-part epoxy which forms a hard resin), a fast acting burn salve (heals 1D6 S.D.C. or 2 H.P. per application), protein salve, plus a mini-oxygen supply. A powerful stimulant that is roughly equal to drinking five pots of coffee and taking a hit of speed. Duration: 24+2D6 hours per dose. Bonuses: The user will not feel fatigued or the least bit sleepy and is +1 to initiative. The character is alert, energetic and will not (cannot) sleep for 24+2D6 hours. This means his level of productivity could be increased by three to four times when the character works for a full 24 hours. speed and skill proficiencies are reduced by half! Prolonged use of boing-go (one or more times a week for over a month) or frequent use (three or more times in a single week) will lead to addiction, with the following penalties: inability to sleep, annoying hyper-activity and fidgeting, difficulty concentrating (reduce skills by 5%), and dramatic weight loss despite the fact the user has a voracious appetite (loses 5 pounds per week). After a few months, the boing-go junkie will have a thin, frail appearance with dark bags around his eyes, and a sickly pale complexion. After the fourth month, the character will collapse from physical exhaustion and will require detox treatment. A reformed addict will become instantly hooked if the character ever takes the drug again. Cost Per Dose: 30 to 60 credits. Last edited by Susan Lee on Wed Jan 24, 2018 10:04 am, edited 4 times in total. Susan was born to two pharmacists in Lazlo. Their relative wealth allowed them to put her through good schooling and she decided to follow in their footsteps, going into the Pre-Med Program at Lazlo University, then into the medical school, where she focused on Cyber-Doccery. The study of human enhancement fascinated her and the intricacies of how machines could improve the endurance, strength, speed, and survivability of the fragile human body. Because Susan had also learned from living in Lazlo that while D-Bees were friends, not foes, there were, indeed, beings in the world who could make a human explode with a casual slap. But they couldn't do that to a 'borg. The unfortunate side effect for mechanically enhanced individuals was a shortened lifespan for Juicers, insanity for Crazies, and a creeping loss of 'humanity' for 'borgs. And then, one day, Susan was perusing an antique bookstore for old medical texts, when she found a small cache of introductory material on higher-level genetic medicine. She had learned the basics of genetics and how DNA worked from medical school, but, as for most of the world outside of Lone Star and Japan, the city-state of Lazlo only understood the basics of clinical genetic treatment. These books, while not much more advanced, showed Susan that the way to improve humanity was through genetics, not machines. Psychics were one possible next step, but they were still fragile mortal creatures. She knew that if she wanted to achieve the goal of making humans able to stand up among the more powerful denizens of the Rifts world, she'd need to do more than just unlock the secrets of psionics - she would need to find a way to make the basic human genetic template mega-damage. And that meant finding samples. MercTown seemed a natural place to begin looking for genetic anomalies. So far, no luck. Last edited by Susan Lee on Thu Apr 04, 2019 11:59 am, edited 2 times in total.